Love eggplants than you are going to love this one. Believe me this is one of those recipes which is a staple in every household and everyone enjoys it. It’s a vegetarian and a frequently made one in my kitchen – Baigan Bharta, an eggplant delicacy !! Roasted, skinned and mashed eggplant sauteed with onion, tomatoes and Indian spices makes it a great punjabi dish. Traditionally eggplants are roasted over charcoal or gas stoves until scalded but nowadays it can be grilled in conventional ovens. Once grilled, they are skinned, mashed and blended with spices. Follow a step by step guide below on how to grill eggplants on a cooktop. Eggplants are very low in calories and rich in fiber. In Indian cooking eggplants can be prepared in many ways like eggplant pakodas, bharwan baigan (stuffed eggplant), baghare baigan, eggplant and potato vegetable (Alu baigan ki sabzi), Tawa sabzi to name a few. Just came back from the grocery store with a bag full of fresh eggplants and am craving for Baigan Bharta aka mashed baigan (eggplant). In this recipe fresh chopped tomatoes are used but you can always substitute it with homemade tomato puree or store bought tomato puree to save time. Simple and a straight forward recipe. Chopped garlic can be added to this recipe to boost up the flavor. For extra spiciness ad garam masala to the recipe but again this is optional. Leftover bharta can be enjoyed as an quick appetizer – Mock pizza – Bharta topped Bruschetta bread . Enjoy this dish with warm rotis and Dal tadka. 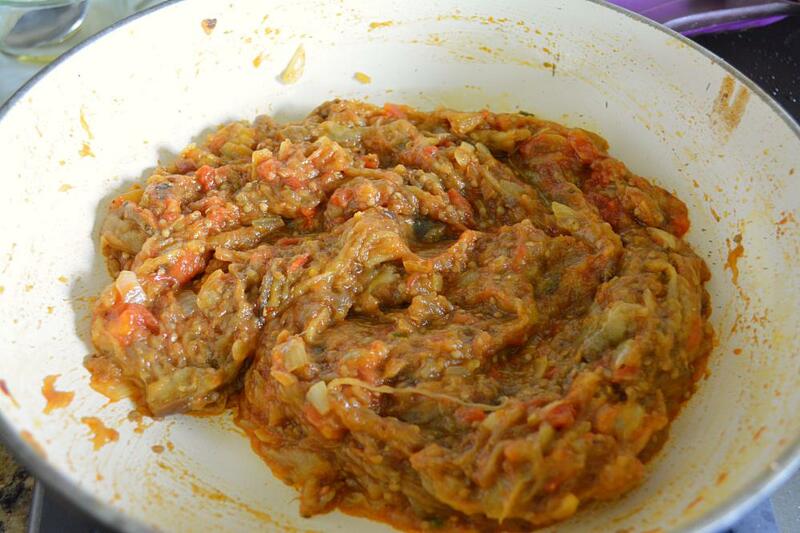 Mashed eggplant cooked with onion, tomatoes and Indian spices. Let's begin by roasting our eggplant first. Using a fork or a knife poke holes in eggplant to release steam. Grease the eggplant before roasting, this way it will be easy to remove the skin. Squeeze it tight to seal all its ends. Roast it over the gas burner. Using a tong keep on turning it. Don't squeeze it too hard or else all the juice will run down and mess up your gas burner. Keep roasting for 20 minutes. Allow it to cool down and then unwrap it. Peel of the skin and remove the pulp. Using a fork mash the pulp and raw bharta is ready. Heat oil in a pan. Add cumin seeds, onions, chopped green chilies and saute till the onions are translucent. Add tomatoes and mix it well. Add in all the spices one by one. Mix and cook for 2-3 minutes, until tomatoes are tender. Add mashed eggplants and using a masher, give it a final mash so that no lumps remain. Keep sauteing for 1-2 minutes till the oil starts to ooze out from the sides. Chopped cilantro leaves and adjust the seasonings. Enjoy it hot with warm rotis. Hi Ruchi, I’m making this right now in freezing snowy London! ❄️ It should warm us up a little! I am oven roasting the baigan so what temperature ( in Celsius) do you recommend please? Is it possible to consume the skin if oven roasted slowly? Also when do the peas go in please? Thank you! Yes, London is freezing/snowy right now. Stay warm! I am oven roasting the baigan so what temperature ( in Celsius) do you recommend please? Please bake eggplant @200 degree C. Apply oil and poke holes in eggplant, wrap in foil and bake for 30 minutes or until the eggplant is charred. Is it possible to consume the skin if oven roasted slowly? Usually the charred skin is discarded because of its strong flavor. Also when do the peas go in please? When the tomatoes are cooked, add peas and saute for 2-3 minutes. Finally, add mashed eggplant and cook as directed. Belated thank you Ruchi. I’ve made this about 5 times since and it’s always a winner! . I now roast for a bit longer but at a lower temperature of150 Celsius and am therefore able to use the skin in the dish. Thank you again. Do you have a vegan lasagna recipe btw ( I have seen your roll up version but am looking for traditional lasagna but obviously vegan. Thank you! I don’t have a vegan lasagna recipe on the blog. Nice recipe and taste wonderful. Ate this recipe at a friends house and was looking for a step guide. Tried your method and love the taste. Thanks for sharing! !